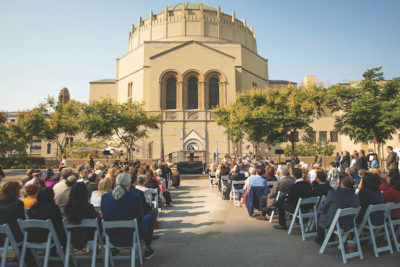 Wilshire Boulevard Temple broke ground on the Audrey Irmas Pavilion last month — a cultural and religious space with a community center on wellness and “purposeful” aging. When completed in 2020, the 55,000-square foot Pavilion will stand along, or more correctly lean towards, Harvard and Wilshire boulevards just east of the Temple, located at 3663 Wilshire. It houses the city’s oldest Jewish congregation. WILSHIRE BOULEVARD TEMPLE is left. New Audrey Irmas Pavilion designed by Pritzker Prize-winning architect Rem Koolhaas and OMA partner Shohei Shigematsu is at right. The $75 million, four-story Pavilion will be the first building in Los Angeles from Pritzker Prize-winning architect Rem Koolhaas and OMA (Office for Metropolitan Architecture) partner Shohei Shigematsu, with collaboration by consulting architects Gruen Associates. ARCHITECTS Shohei Shigematsu and Rem Koolhaas. In addition to a new chapel and terrace, it will include a grand ballroom, meeting rooms, performance spaces and a rooftop sky garden with views of Koreatown and the Hollywood Sign. The first-floor banquet hall will boast a 36-foot-high ceiling. Key elements of the new design echo the historic Temple next door: the Pavilion’s half-circle entry door is a nod to the Temple’s 1920s dome, inspired by the great cathedrals of Europe, according to wbtla.org. The leaning, geometric-shaped new Pavilion features rectangular windows that are patterned after the Temple’s interior. The Byzantine Revival style Temple opened in 1929 and is now on the National Register of Historic Places. 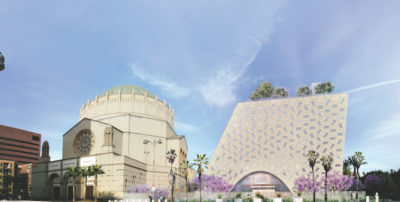 “In creating the Audrey Irmas Pavilion, we sought a design that would not only create much-needed new facilities, but also embody the vision and intention of our congregation to be a dynamic part of the 21st-century spiritual and cultural conversation that is Los Angeles,” said Rabbi Leder. 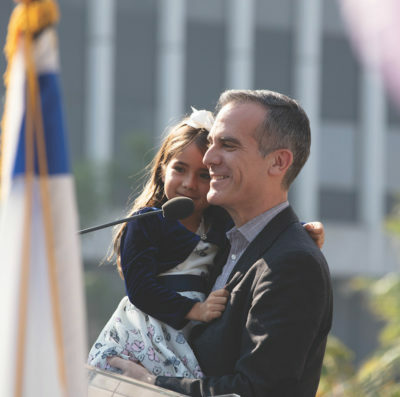 MAYOR Eric Garcetti and daughter Maya at groundbreaking ceremonies. 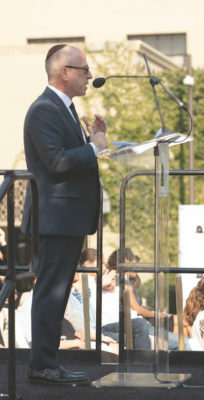 Inside, the Annenberg Foundation is building a community center that will seek to inspire a path to purposeful aging through wellness, tech exploration, social connections, financial education and more, added Rabbi Leder. “Americans are living longer than ever before. That’s a wonderful thing. 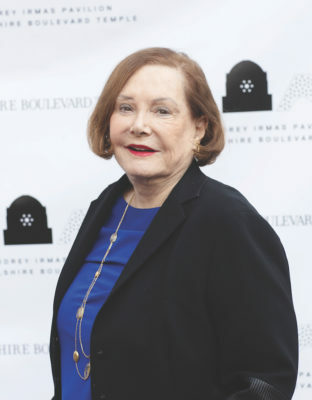 It also presents us with an important challenge: how to make those longer lives meaningful and purposeful, so older Americans can keep learning, growing and giving back,” donor Wallis Annenberg said in a press release. “In my view, this community center can do an enormous amount to engage and stimulate older Angelenos. It’s the kind of innovative approach that we need now more than ever. Our older years really can be our best years with the right support, engagement and community life. That’s exactly what this effort aims to provide,” she added. Completion of the new building is planned for late 2020. AT THE GROUNDBREAKING, left to right, are: Cinny Kennard, executive director, Annenberg Foundation; philanthropist Audrey Irmas; Wilshire Blvd. Temple Senior Rabbi Steven Leder; Temple Cantor Don Gurney; philanthropist Erika Glazer; Temple President Alberto Valner; Councilman Paul Koretz; Council President Herb Wesson; Mayor Eric Garcetti and daughter Maya; County Supervisor Mark Ridley-Thomas; and architects Rem Koolhaas and Shohei Shigematsu. The congregation was founded in 1862 during the early years of the Lincoln administration, and the land at the current site was purchased in 1921, according to the wbtla.org website. How wonderful! Thanks, Peggy. Loved your guest feature, too.